Our super strong neodymium disc magnets have wide variety grade N35, N38, N40, N42, N45, N50 and N52. The strong neodymium discs have Nicuni, Zinc and Epoxy coatings, sometimes the disk magnets with a countersunk hole that drilled in the middle to attach it to nonmetallic materials, such as wood or plastic plant. These round magnets can allow the screw’s head to reside below, or maybe with the face of the magnet to ensure it doesn’t interfere with the magnet’s performance. Neodymium disc and round magnets are widely used for motor, sensor and holding applications. • HSMAG disc Neodymium magnets are magnetized through the thickness. Rare Earth Disc Magnets, also called disc neodymium magnets, are the perfect marriage of small size and maximum power or strength. 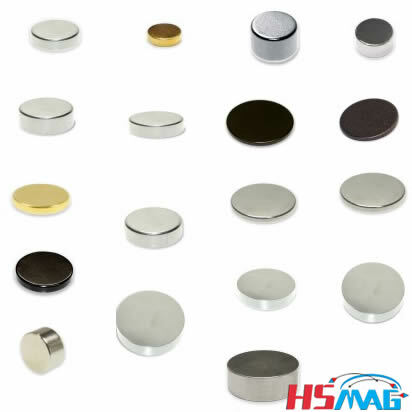 HANGSENG Magnetics provides a large variety of Neodymium disc magnets in a variety of sizes and with several coatings such as Nickel, zinc or Gold for protection against corrosion.